There have been a number of well publicised project failures culminating in several reports, notably Egan and Latham, on how the infrastructure industry could work more effectively. Alongside contracting frameworks that share risk and encourage collaboration, these have brought the importance of leadership, people and culture to the forefront of procurement. Put simply, infrastructure procurers need to understand who they are working with and mobilise the right people for the job. Successes such as Terminal 5 show the value of embracing collaboration, innovating and reducing risk in order to deliver to programme and budget, hence the increased focus on using behavioural assessment in selecting supply chain partners. That was the message given by over 70 procurement and commercial leaders within the infrastructure industry at a seminar on the topic of behavioural assessment. The focus on behaviours was cited as a key influence in improving the industry’s working culture and leadership capabilities and even in enhancing the industry as a magnet for young and future talent. 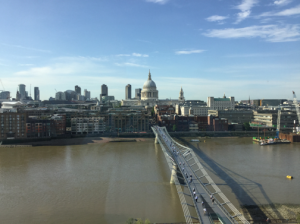 The seminar at Tate Modern was a collaborative effort between MDV Consulting, Berwin Leighton Paisner (BLP), Invennt and Turner & Townsend. Guest speaker Peter Quarmby, Programme Director of the TEAM 2100 Programme at the Environment Agency (EA) was well received in giving the client’s perspective. Representatives included organisations such as Balfour Beatty, the Cabinet Office, Crossrail, Highways England, HS2, Mace and pathfinder utilities including Anglian and Thames Water. 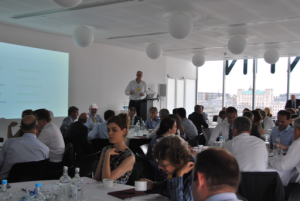 Having heard from a series of speakers the event created the opportunity for industry opinion formers to share and discuss the key opportunities and challenges faced when introducing behavioural assessment into the procurement process. Project complexity is driving the need for greater collaboration. Increased implementation of behavioural assessment is contributing to the development of better behaviours across the industry, which in turn is influencing better partnerships and joint ventures and more collaborative ways of working. As client organisations analyse their own leadership qualities and the behaviours needed to communicate, innovate, collaborate and deliver, this is bringing about improved understanding and developing of their own behavioural model. Defining the criteria for procurement and contractual outcomes, this focus on behaviours is leading to positive changes in the way organisations recruit, assess and develop their own leaders and people. In the early 1990s, BP used their Tier 1 selection and alliancing processes with second and third tier suppliers, with the success of that approach recorded in the book, ‘No Business as Usual’. A representative from Anglian Water noted that their alliance was starting to assess behaviours further down the supply chain as they recognised the delivery of their Tier 1 partners relied heavily on second tier suppliers. An inherent fear of being more open to challenge when applying behavioural assessment, rather than sticking with more tried and tested methods, was identified as a potential deterrent. The perceived heavy financial and resourcing implications for delivering this kind of assessment is also acting as a barrier to its greater use. The benefits of such assessment are clear and if aligned with factors that will lead to project success, it is evident that the benefits far outweigh the costs. 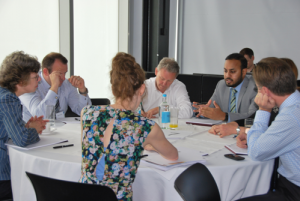 As one participant commented,“If you invest and get it right, you get the best team, not the best guesser”– emphasising the need to look beyond the bidder’s pricing estimate. Agreement on the driving philosophy behind the assessment and clarification on the value sought alongside the other commercial and technical factors. Reflecting on the client’s own culture and behaviours with a commitment to align the assessment criteria to their desired culture. 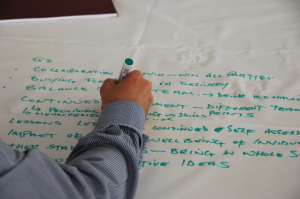 The necessary engagement and dialogue with internal and external stakeholders. Early and meaningful dialogue with bidders to explain the benefits sought from behavioural assessment by reference to contract outcomes, would help contractors prepare more effectively. Transparent procurement processes which allow questioning and some criticism by bidders – face-to-face supplier briefings and conferences were named as the most useful way of clarifying expectations and an avenue for question and answer sessions. Identification of development needs in clients’ own teams. Improved post-assessment briefing with structured quality feedback given to help contractors better prepare for future assessments. Alongside transparency, there is an overriding requirement in any kind of behavioural assessment for objectivity – in the issues tested, in the manner of the assessment and in the method of evaluation, scoring and moderation. This was considered in detail at the seminar. Where to position the assessment? Some were concerned that positioning the assessment too early incurred a high level of costs, whereas positioning too late in the process might run the risk of not having sufficient partners with the right skills still in play. Stella Mitchell from BLP and Peter Quarmby from the EA both agreed that if asking the right questions at pre-qualification stage, the written evidence obtained should demonstrate the right approach, behaviours and focus by potential suppliers. The client should therefore be able to assess some behavioural elements as a function of experience and capability at the pre-qualification stage before undertaking a more extensive behavioural assessment process at the bid evaluation stage. What weighting for the behavioural component? The appropriate weightings to be given to the behavioural element when evaluating tenders were debated. Stella Mitchell emphasised the importance of agreeing this weighting upfront before issuing the ITT and getting senior management sign-off to this. She explained the importance of balancing the weighting against other important criteria, such as price and technical quality, in proportion to the demands and required outputs of the intended contract. Peter Quarmby said the Environment Agency had decided upon a 25% weighting for the behavioural element as well as having technical scoring that required evidence of behaviours in practice. Another participant had previously used a significantly higher percentage for the non-financial element as the behavioural component was considered so crucial to the overall success of the project.